Arriving at the Observatory as the new Astronomer Royal in March 1720, Edmond Halley found it devoid of instruments. He was given £500 to re-equip. 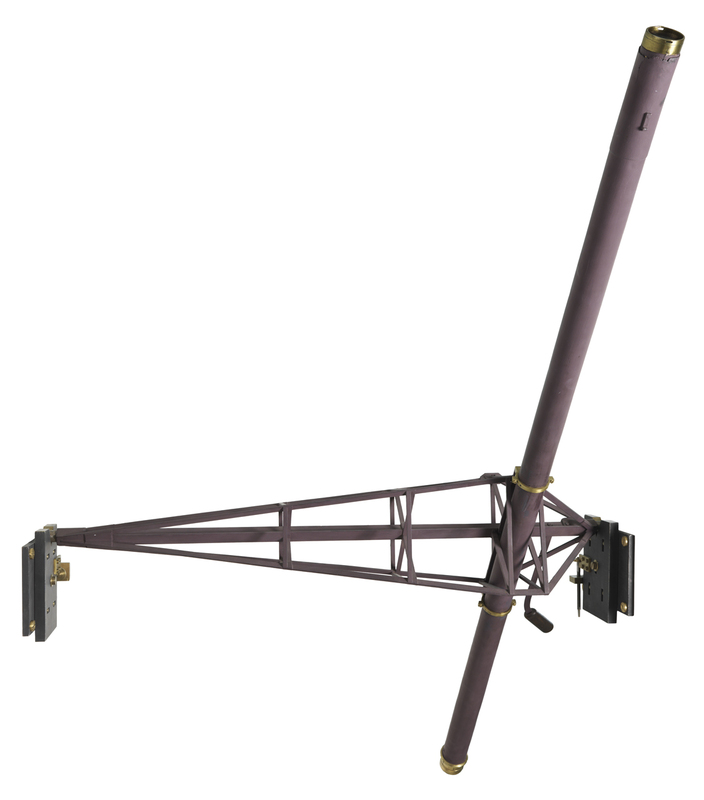 The 5-foot Transit Instrument was the first of two new meridian instruments that he acquired. It came into use in 1721. The other instrument was the 8-foot iron Mural Quadrant by George Graham which was installed in 1725. The Transit Instrument remained in use until superseded by Bradley’s 8-foot Transit Instrument at the start of September 1750. Mounted in the plane of the meridian, the Transit Instrument was used in conjunction with an accurate pendulum clock to ascertain the right ascension of a heavenly body. This was done by measuring the (sidereal) time at which it transited (crossed) the meridian. Certain of the brighter stars, whose positions had been refined by repeated observation over a long period of time, were used as ‘clock stars’. By comparing their observed times of transit with their theoretical ones, the errors of the transit clock could be determined. Having been adjusted to the meridian, Halley’s Transit Instrument was used as a standard of adjustment for the 8-foot Iron Mural Quadrant. It defined the Greenwich Meridian from 1721 until 1750. The telescope has a brass tube 5 feet 6½ inches long and an aperture of 1¾ inches. The object glass survives, but not the eyepiece, setting circle or Ys in which the pivots rested. Originally the magnification was less than 40 times and the cross-wires consisted of just a single vertical wire. The axis on which the telescope is mounted is 3 feet 6 inches in length. The telescope is mounted 13 inches off-centre and is supported by four brass braces on each side, which according to Smith (see below) were designed to stop it from ‘springing’. In practice, if the braces were handled in any way, the expansion caused by the heat transferred where it had been touched, made the axis deflect and skew the telescope away from the plain of the meridian. This remained the case even after they had been wrapped in cloth in an attempt to insulate them. There are no contemporary references to a maker. Lalande however wrote in the preface to Halley's tables which he re-published in 1759 that the maker was Robert Hooke. Since Lalande was only nine when Halley died, it is not obvious on what he based this assertion. Hooke himself died in 1702. There is no mention in the literature of him owning a transit instrument or having used one. Howse (1975) surmises that even if he didn't make the complete instrument, it may have incorporated one of his telescopes. In 1721, a ‘little boarded shed’ was erected to house the new instrument. Squeezed into an awkward corner near the Western Summerhouse, it bridged the gap between the wall on the western boundary and the room that had been Flamsteed’s study. 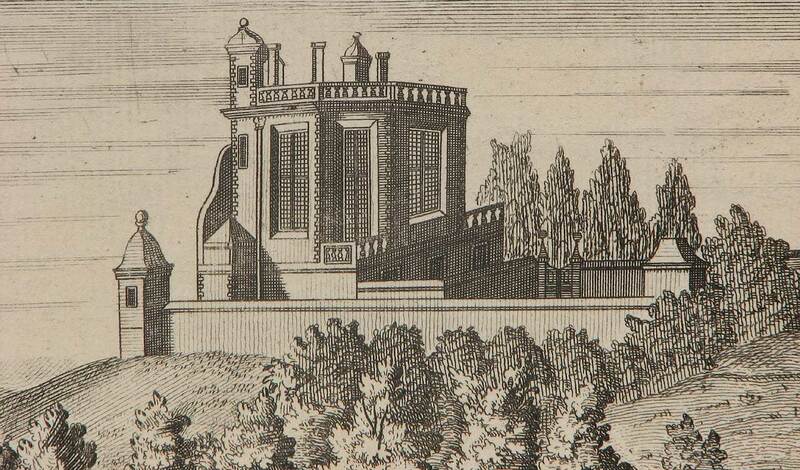 In the minutes of the 1726 Visitation, it was described as ‘a little Room built on purpose, adjoing to the West side of the Observatory, & fitted up with proper openings both at the top & each end for directing the Telescope to all parts of the Meridian’ (RGO6/21/21). Interestingly, the Transit Room is conspicuously absent in all known contemporary images of the Observatory. 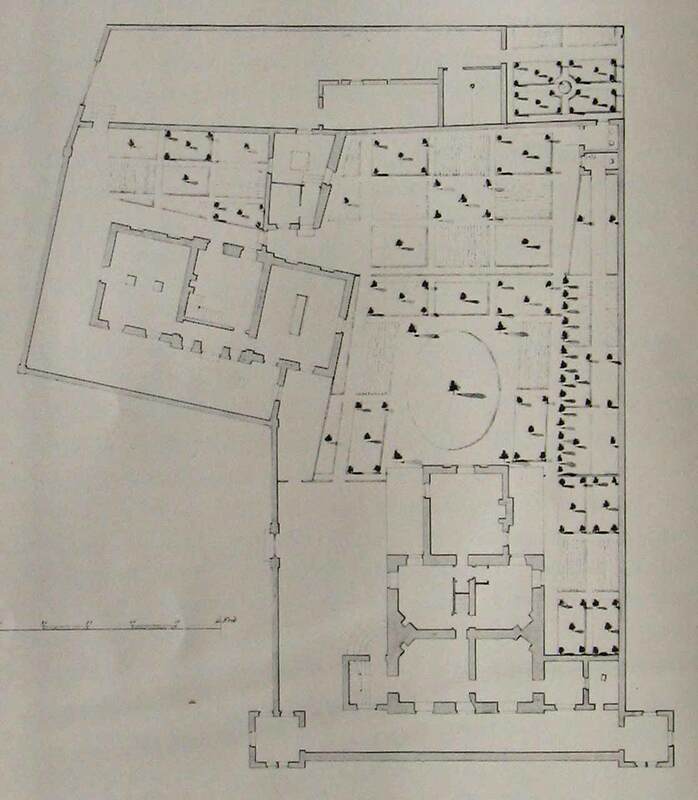 The only plan on which the Transit Room is known to be shown is that drawn by John Evelegh at some point between 1750 and 1773. It can be be seen in the bottom right hand corner. The plan implies the presence of a brick built room rather than a shed. Still in existence in 1765, it was probably demolished in 1773 when Maskelyne built an extension onto the south side of the summerhouse. Unlike the later transit instruments, which were mounted centrally on the horizontal axis about which they rotated, Halley’s instrument was mounted off centre. Not only that, the telescope was attached at a considerable distance from its centre of gravity. 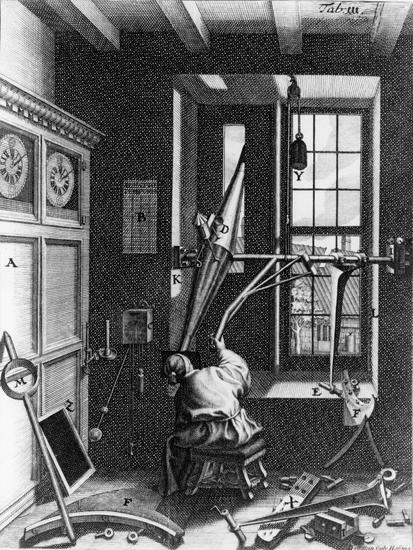 Other known instruments with an off-centre axis are the World’s first transit instrument which was constructed by the Danish astronomer Olaus Römer in 1689 and that owned by Bradley and used by him in his observatory at Wansted. Römer’s instrument was presumably designed like this because of the geometry of the window in which it was mounted. Bradley’s may have been mounted in a similar way for much the same reason. Although it is not known how Bradley had his mounted at Wansted, it is known that when he moved it to Oxford in 1732, he set it up ‘in one of the windows of the Museum’. Halley’s instrument may have been constructed with an off-centre axis to directly emulate that of Römer, or maybe because there was some perceived scientific advantage. It was more likely made that way out of necessity so that it would fit into what was a very tight space in the Transit Room whose walls were skew to the meridian, whilst allowing sufficient space between the two Ys supporting the Pivots so that they could be properly examined. Evelegh’s plan shows only one pier. This is in the centre of the room and is consistent with what Joseph Crossthwait communicated to Abraham Sharp in a letter dated 1 June 1721, in which he described the building as containing a stone fixed in the ground which was about 4 feet high. Measurements from Evelegh’s plan suggest that the Transit Room was just 6⅔ feet wide by 9½ feet deep. The implication of all this, is that the telescope was mounted with the longer section of the axis on the western side with the eastern Y of the instrument fixed to the stone and the western one to the boundary wall. The off-centre mounting of the tube would have allowed sufficient room for the observer to get his head behind the instrument when looking towards the northern horizon, whilst at the same time allowing the observer to view the southern horizon without the telescope tube hitting into the western wall. Having said all that, the report of the 1726 Visitation (RGO6/21/20) describes the instrument as being supported by ‘free stones’, implying that there may have been two rather than just one. In the same report however, there is also a breakdown of the costs, where the cost of ‘the stone‘ (singular) and the mason’s work is given as £1. 10s, apparently contradicting the earlier statement. Smith On the other hand, wrote in 1738 that it was ‘supported upon two freestone pillars, erected upon a very large stone laid deep in the ground‘. If there were two stones, the second would have needed to be very close to the western wall. When Bradley arrived at Greenwich as Astronomer Royal in June 1742, the telescope had been unused for over ten years. His first act was to have two extra vertical wires added, to have the telescope properly balanced for the first time, to invent an apparatus for illuminating the wires and to commission a new level for adjusting the ‘axis truly horizontal’. He then set about checking the alignment by observing the meridian mark to the south. On 1 August 1743, a shorter focus eye-piece was fitted so that the telescope magnified about 40 times. 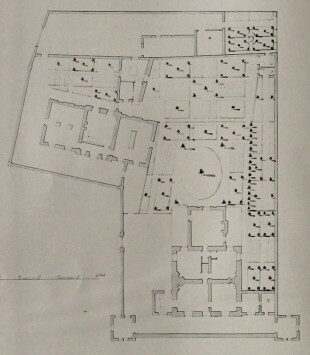 Howse (1975), states that in 1746/7 a new setting semi-circle and level were supplied by John Bird. In Halley’s time, the telescope appears to have been used with only with a south mark, placed about a quarter of a mile away on the Park wall to the north of the Rangers House, which at that time was lived in by Admiral Hosier. Bradley also used a mark that he attached to the chimney of a house in Greenwich, whose location is no longer known. At Wanstead, Bradley reversed his instrument and had two marks side by side to allow for the off-centre mounting. That there was only ever a single southern mark used by Halley suggests that it was not possible to reverse the instrument in the space available. This seems most unlikely for two reasons. Firstly, it would have had to have been set up to the north, as the horizon was blocked by the Park wall just a quarter of a mile to the south. Looking northwards, the meridian of the telescope entered the River Thames at a distance of about half a mile, continuing for a mile over water until clipping the edge of the Greenwich Peninsula, where it followed what is now the embankment for about 200 yards before re-entering the River, emerging on the north bank at a distance of about two miles from the Transit Room. In Bradley’s day, the Peninsula was marshland and used by the Ordnace for the storage of explosives, whilst the river itself would have been cluttered with moored and masted boats which are likely to have impeded the view of any mark that lay beyond them. The fact that Hornsby gives the distance as more than a mile makes the truth of his statement unlikely. The second reason for doubting him is that if Evelegh’s plan is correct, and the not unreasonable assumption is made that the instrument was mounted on the western side of the Transit Room, the geometry of the room would have prevented the telescope from being lowered to the horizon in the reverse position. The evidence on which Hornsby based his assertion is unknown. Click here to read more about the southern marks and Bradley's observation of them. Click here to read more about the northern mark and other structures on the telescope’s meridian. The Observatory is depicted on the left. The chimney to which Bradley attached his northern meridian mark may have belonged to the middle house of the group of three fronting the Park on the right. 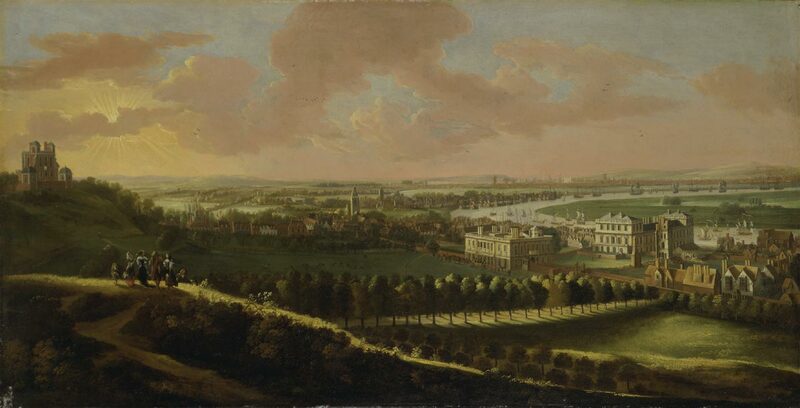 Jan Vorsterman, Greenwich, with London in the distance, c.1680 (Yale Center for British Art). The inventories that were compiled from time to time at the date of the Visitation was by the Board of Visitors show suggest that Halley’s instrument remained in its Transit House until at least 1765 and probably until it was demolished. At the 1774 Visitation, (by which time, the Transit House had been demolished), it was described as ‘wholly useless’ with the comment that it ‘may be disposed of, as the Board of Ordnance shall think proper’. In the event, it seems to have been stored somewhere on site, probably in the Great Room (later known as the Octagon Room). Although there seems to be no further mention of it in the later inventories taken during Maskelyne’s period in office, it is mentioned by Thomas Evans, who worked for him at the Observatory from 1796–98. In a description of the Observatory, which was written by him and included by John Evans in his book The juvenile tourist, he states that it was in the Great Room. At some point, it was moved to Bradley’s Transit Room, where it is known to have been in 1818 (RS MS372/170) though wrongly described as being Flamsteed’s. Still there in 1824 and 1830 (RS MS371/70&71), it probably remained in situ until moved to the new Transit Circle Room in 1850. There it was hung with other ancient instruments on the western wall (See Howse (1975) fig. 74 for a photo taken c.1898). Still in the Transit Circle Room in 1908, it is believed to have remained there until the 1950s. In 1951, it was lent for display at the Festival of Britain on London’s South Bank. It was one of the telescopes on public display in the Octagon Room in Flamsteed House when it first opened to the public on 8 May 1954. There it was displayed on light-weight wooden piers. It was formally acquired by the National Maritime Museum in 1955/6 (Object ID: AST0979). In 1960, when more of Flamsteed House was opened to the public, the telescope was moved to the floor below and put on open display in a position to the left of the French windows in the south-west corner of the building in what was then known as the Halley Gallery. In 1967, when the Meridian Building was due to open to the public, it was moved to ‘Bradley’s Middle Room’ and displayed alongside the later Bradley Instrument. Here it was mounted on new replica Y’s based on those of a contemporary instrument described and illustrated in Smith’s Opticks (1738). It is believed to have subsequently remained on continuous display in the Meridian Building until early 2014.